Super easy snack idea for you guys today. 5 Minute Granola Bars. Only 6 ingredients and 5 minutes to throw them together. You can even make them nut free for school friendly snacks! 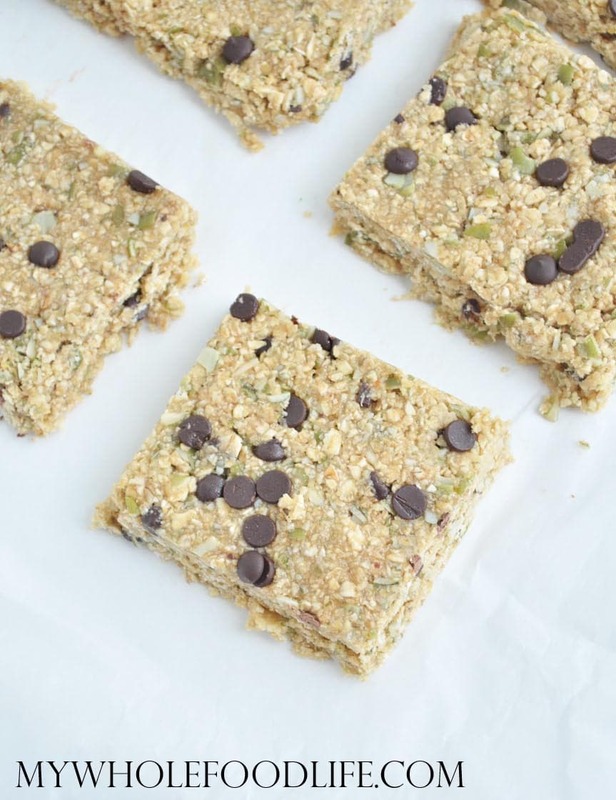 Use this 5 Minute Granola Bars recipe as a base, and add in whatever flavors you like. If you like no bake bars, you will also like my Almond Joy Protein Bars and my Almond Butter Protein Bars. These bars are vegan and gluten free. I will provide a nut free option in the recipe as well. If you wanted to boost the protein a little more, you could add some chia seeds or hemp hearts. If you are a visual person, I created this short video showing you how to make the bars. For more videos, you can subscribe to my You Tube Channel. 1/3 cup mini chocolate chips (Enjoy Life chips are dairy, gluten and nut free. In a food processor, combine the oats, peanut butter, pepitas, salt and maple syrup. Then add in the chips and pulse a few times to get them evenly mixed in. Line an 8x8 pan with parchment paper. Leave enough paper to come out the sides. Press the mixture down well into the 8x8 pan . You really want to pack it so the bars hold together. Place the pan in the fridge to set. Should take 30 minutes. Once set, pull the whole thing out of the pan by the extra ends of parchment paper. Use a pizza cutter to cut them into bars or squares. Store in an airtight container in the fridge. They should last a couple weeks. Enjoy! Just made a batch, and they taste delicious! I used a mixture of crunchy and creamy peanut butter. I don't have a food processor, so I mixed the dry ingredients together first, then added the honey and peanut butter. I stirred it up till most of the honey was incorporated, then mixed it more with my hands till it was evenly distributed and formed a ball in the bowl. Very easy! Even without a food processor they took me about 5 minutes to make! Would I be able to do this recipe(and other recipes) without maple syrup?